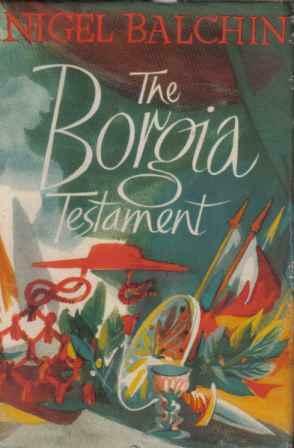 Synopsis: The Borgia Testament is an account of the life of Cesare Borgia (1476–1507) told in the first person in novelistic form and largely in modern idiom. The narrative is principally concerned with the years between 1492, when Cesare’s father is elected Pope and Cesare himself is made a cardinal, and 1507, when Cesare is brutally murdered by his long-time adversaries the French. Aside from undertaking several missions as a Papal Legate, most of Cesare’s time and energy during this period are occupied with his grand plan to create a unified Italy, which involves forging alliances with rival powers, be they Italian, Spanish or French, conducting military campaigns and disposing of anyone who attempts to get in his way. Context: The idea came to Balchin when he attended a wartime revue that contained a skit about the Borgias. He wrote this book as an attempt to challenge certain popular misconceptions about the Borgia family, spending four to five years researching his subject. Verdict: Difficult to fully appreciate without a detailed knowledge of the period in question, The Borgia Testament certainly feels as if it is historically accurate. It can be recommended for its wit, thoughtfulness and archetypal readability. Availability: Reasonably easy to get hold of, either in second-hand bookshops or on the Internet.